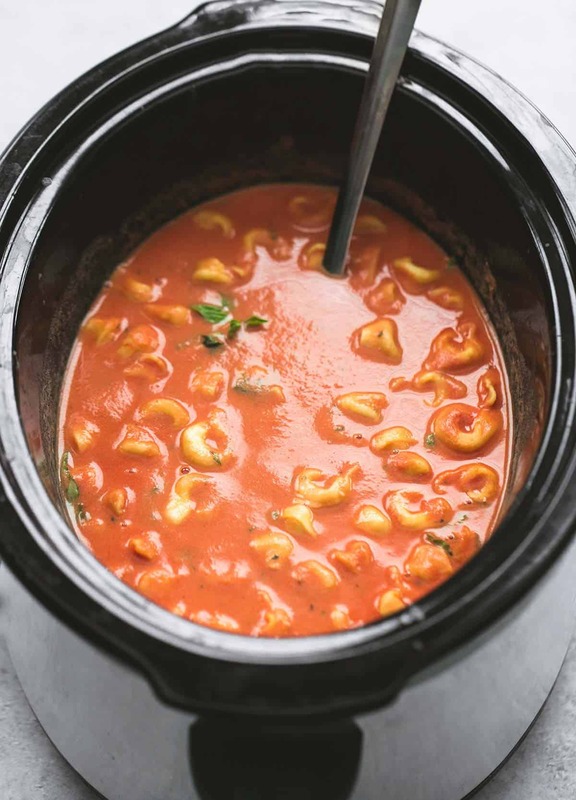 Slow cooker tomato basil parmesan tortellini soup is easy, healthy, delicious, and a cinch to make in your crockpot – perfect for cool weather nights! All day every day. That’s how often I’ll be eating this soup thank you very much. Slow cooker soups are kind of my jam. I’m already busting out the crockpot three to four times a week and soups literally sound good to me every single day – year round. When official soup season rolls around I go a little crazy. 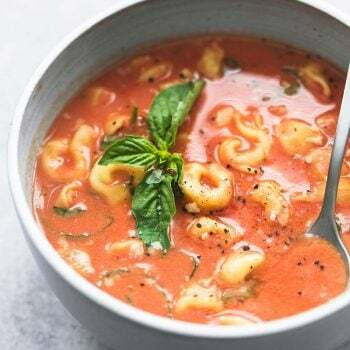 This is a little twist on my favorite slow cooker tomato basil parmesan soup which normally doesn’t call for tortellini, but I’ve been on a pasta-in-soup kick for a bit now and this was bound to happen. Thank heaven it did because this soup….. seriously no words. 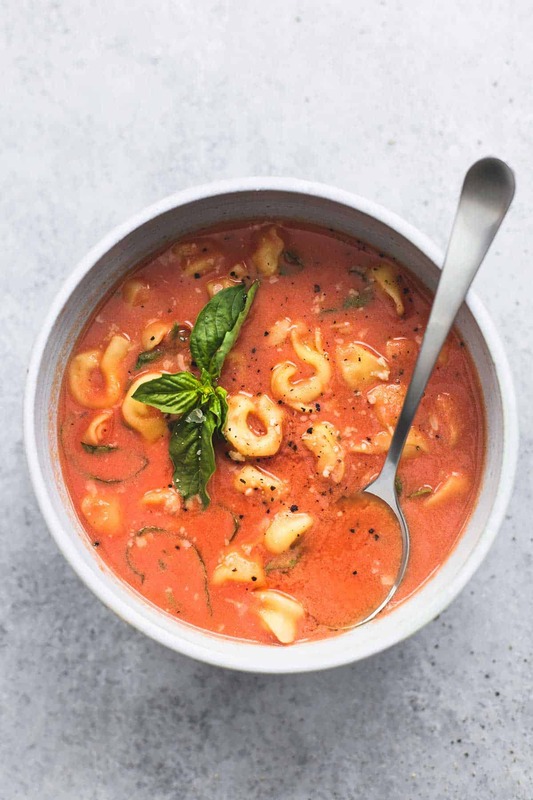 It is creamy and cheesy and tomato-y, and has the perfect broth-to-pasta ratio. On top of all that, it’s in the slow cooker and your house will be smelling like a soup n’ sandwich shop by the end of the day. If they made a candle that could make my house smell this heavenly I would absolutely buy ten of them, but until they come out with an Autumn Creamy Tomato Basil Soup scented candle I’ll be making this deliciousness on the weekly to get my fix. 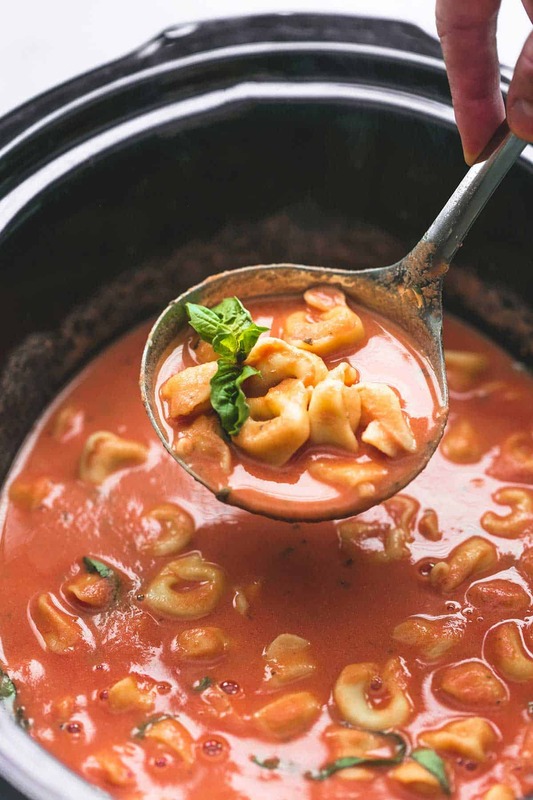 Slow cooker tomato basil parmesan tortellini soup is easy, healthy, delicious, and a cinch to make in your crockpot - perfect for cool weather nights! Add flour to melted butter and stir until flour clumps up. Slowly whisk in the heavy cream (or half & half) until mixture is thickened and smooth. Add roux, parmesan cheese, and tortellini to crockpot and stir to combine. What I attempt to print this recipe it shows up as a blank page. Help! 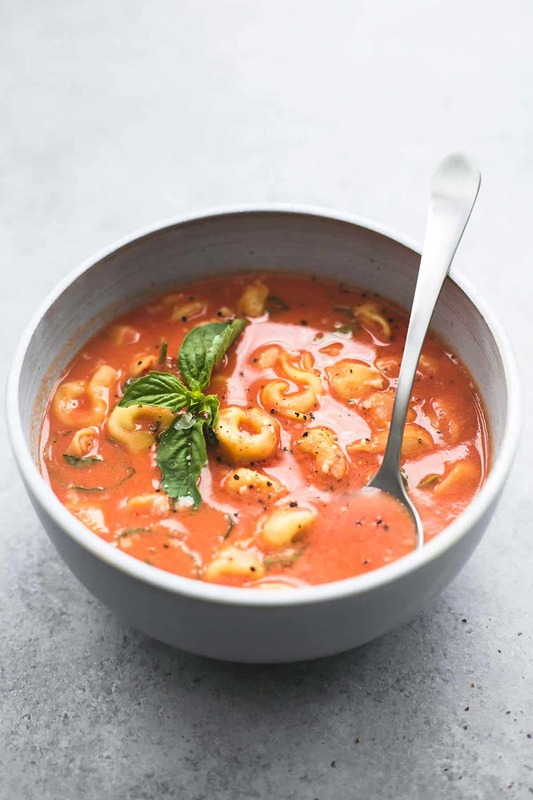 I make a very similar version of this soup without the tortellini. I love the idea of adding some pasta though! It sounds so delicious and would be perfect to reheat for lunch at work. I think I’ll leave out the tortellini and make some grilled cheese sandwiches to go with this. Sounds great. When I try to print the recipe all I have is a blank page. Do the tortellini need to be cooked first? I made this and it’s really good! The ONLY thing I didn’t do was add the tortilini. I had left over brown rice so at the end of everything I put it in. Yummy 😊I’ll be making it again this fall! I just made this last night, so good! Came out super creamy and flavorful and so easy to make. Does it really call for a total of 2 cups of heavy cream? This was absolutely delicious! I have a family of picky eaters and they couldn’t get enough of it; they each had seconds. Thank you for the great recipe! Isn’t it the best when you can please all the picky eaters! I am so happy to hear that you all loved this recipe!! 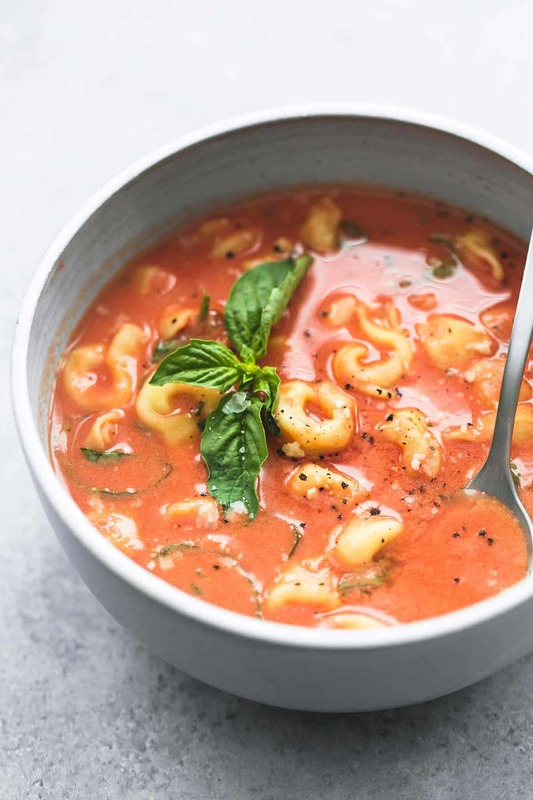 What type of torTellini do you Recommend? Cheese filled or meat filled? Either would work in my mind, but you dont specify either in your recipe. Which looks marvelous by the way! I don’t have a slow cooker/fast pot. is there anything in the menu that needs to be changed? can I just use a large pot. what about the timing of it all? Simmer it all for about 30 minutes, stir in tortellini the last 5 minutes! Thanks! Recently retired and looking forward to trying more of your meals. I made your chicken with sundried tomatoes which was very good. Just made this. Yum! Its officially our new favorite soup for fall. You were absolutely right about it being the perfect broth to pasta ratio. I cant get enough. Great job, Nita! Thanks for your feedback! Hi! is it really a tabLespoon of salt, and Not a teaspoon? That seems like a lot?